After painting some landscaping pots last week, I couldn’t wait to get some pretty spring flowers into them. But it’s been cold and rainy here in South Carolina for about a week. 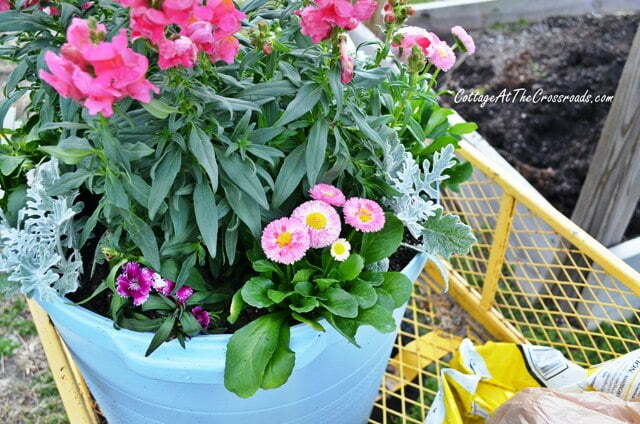 When the sunshine came out Friday, I was off to the store to get some bedding plants to put in one of the pots. I decided to use this pretty blue pot, and you can see our rainbow of painted plastic pots that I showed you in my last post. Since these pots are large, I upturned a smaller plastic pot to save a little on the soil. 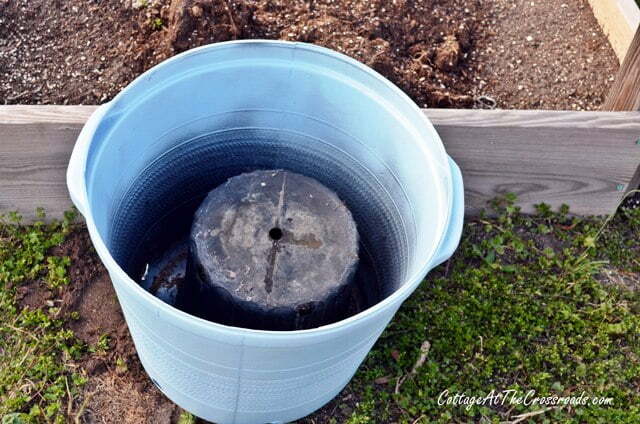 The soil mixture that I put in my pot is the same mixture that we put in our raised beds. 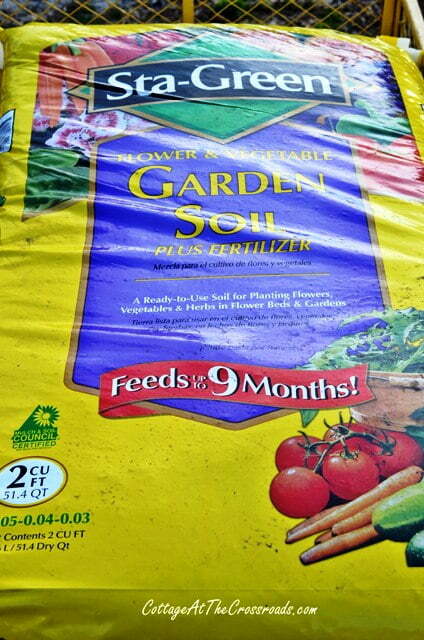 In fact, Leo just dumped a bag of this garden soil in the raised bed that was closest to the pot that I was filling. He also added a bag of Black Kow which is composted cow manure, and he had already added some of our own homemade compost into the beds about a week ago. So I just mixed that all together and started filling the pot. After filling the pot with my soil mixture, I lifted it into our garden cart because I knew I was going to move the pot to a protected area. We are having unusually cold weather here and a hard freeze was expected over the weekend, so I didn’t want to leave the tender plants outside. It was easy to lift the pot because it’s plastic! I put some gorgeous pink snapdragons in the center of my pot and filled the outside edge with some white pansies, dusty miller, dianthus, and English daisies. Here you can see the little English daises better. I have never grown them, but I couldn’t resist their little pom-pom heads at the store! Spring in a pot! Nothing lifts my spirits more that playing in the dirt and seeing something like this! How about you? 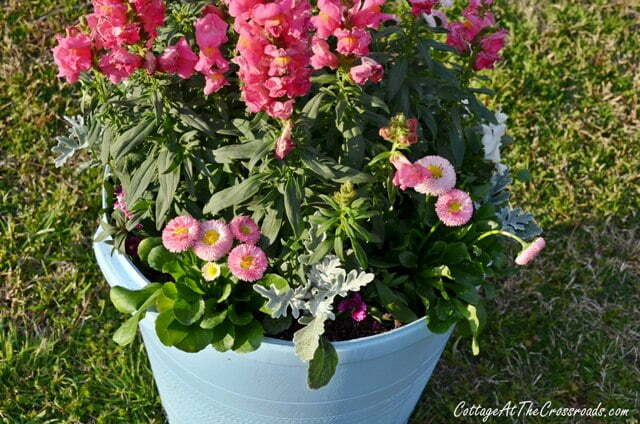 Are you ready to put spring in a pot? The container is so beautiful. It’s screaming spring time. We have so much snow on the ground…your pretty flowers have me wishing for some warm sunshine soon. So pretty! 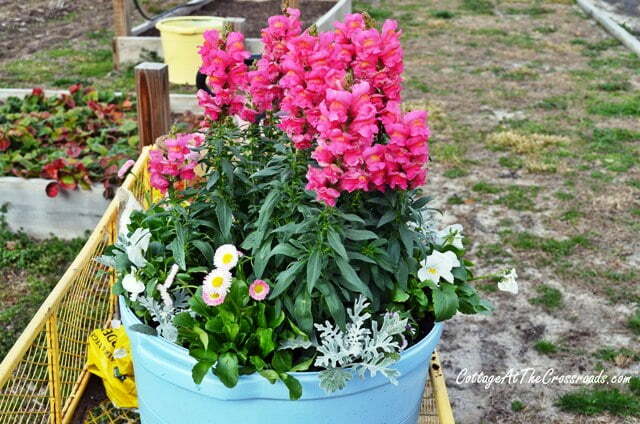 I am really hoping that my snapdragons come back this year. They usually bloom most of the winter here in Dallas but it has been so dry. I really enjoyed your video at Mrs. Hines’ Class, good good stuff! I just saw you on the video chat and am so excited to be following your blog. Your garden pictures were definitely inspiring. I love the painted flower pots too. I have been wanting to do a garden for so long and just seem to get bogged down in the details…soil, containers, thinning seedlings. 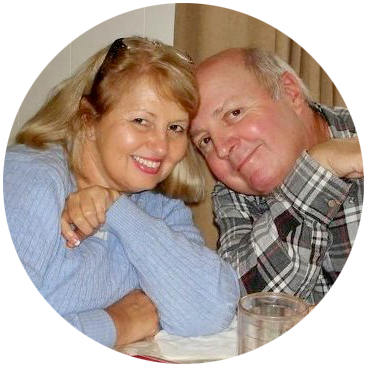 I’m looking forward to the inspiration you and your husband share on your blog. So fun to see you and the others giving great tips. Have a wonderful weekend! Love those colorful pots! Annie Sloan chalk paints are my favourite for plain clay pots because I can water it down. Keep the Spring colors coming. Cheers! I was trying to see what the small flower was but now I think it is the English daisy…it’s beautiful. So petite and pretty. I’m seeing a lot of Spring flowers at Walmart now. We need to go to Lowe’s soon and I’m sure they’ll be out front. Happy Spring! Oh man those are so pretty! 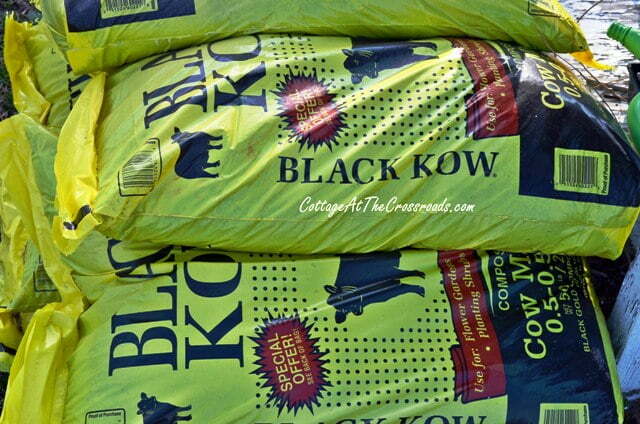 They will love that composted cow manure! 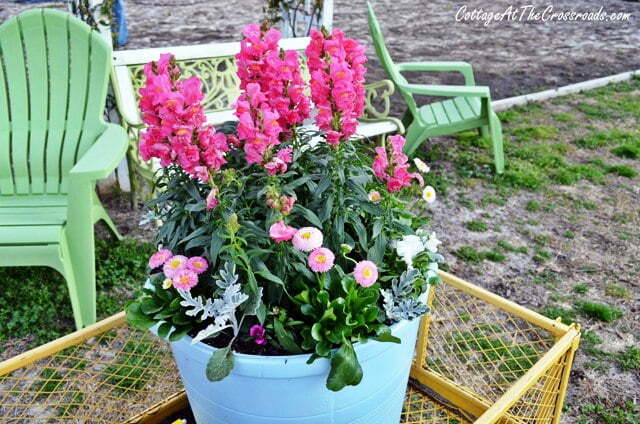 Snapdragons and English Daisies! How cute…. Lucky you getting to plant so early. It will be May before I take that chance here! What a gorgeous, cheery combination! 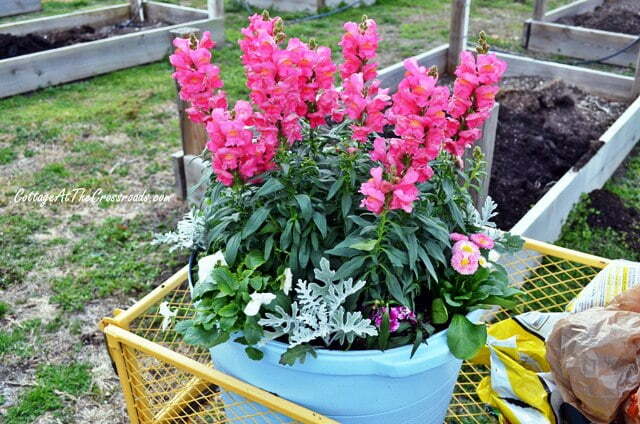 I love snapdragons. Gorgeous Spring flowers. I can’t wait for color outside. I am so tired of the dingy brown and cold weather. I loved your color and flower choices. It brightens up your soul. Jane, I’m so ready to plant everything for our porches and deck; however, we might be getting another snow tonight!!! So tired of the white stuff and so ready for playing outside in the dirt! 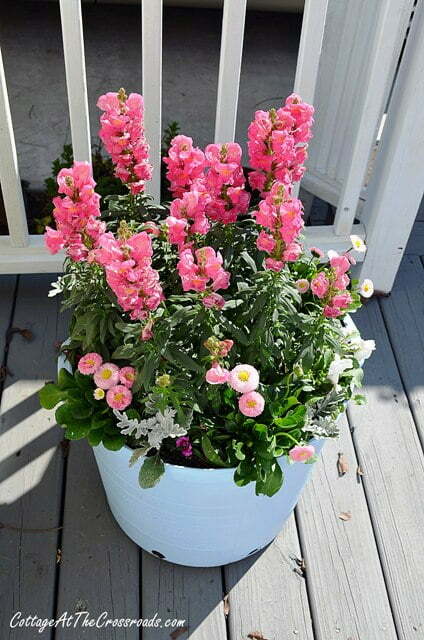 Cute Spring in a Pot, love the pinks, beautiful. Right now, I only have snow in my pots but I’m thinking about Spring and sure love seeing your spring pots. A great mixture of annuals! I am so jealous. We’re in eastern NC here and can hardly wait for the warmer weather. Bill is putting in three new raised beds and we’re having some great garden soil delivered this week. So excited. He has spring peas up about four inches now. Looking good. Your flower pots are beautiful and I’m looking forward to doing a lot of in the pot gardening this year. Great combinations you came up with. I’m so looking forward to your gardening posts as you plant and raise. Keep up the great work. Beautiful Jane! Nothing lifts my spirits like blooms and playing in the dirt either! I’m ready for spring! Oh Jane…I would give anything to be planting pots right now. Yours is so pretty and the colors are incredible. We are expecting several, as many as 8, inches of snow beginning tomorrow afternoon. Ugh. I am so over it! Thank you for the breath of fresh, spring air! Boy, that gives me Spring Fever for sure! Loving that pot!!! Can’t wait for warm weather! We’re supposed to have snow here (Central NC) on Wednesday….ugh!